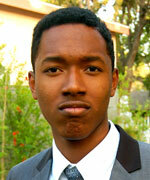 Adam Washington, a senior at Blair High School, is 17 years old and is the middle child. He is Andrew’s older brother. Adam is very involved at his school and its activities from ASB, Yearbook, to Interact Club and FHA-HERO club. Adam loves to dance, sing, cook, and take photographs.